Tall Grass Spirits are now cheaper! We’ve heard from some of you that our pricing was a barrier to enjoying our Tall Grass craft spirits. We heard you loud and clear and understood 100%. Making craft spirits the way we do isn’t cheap. Small batch production means large overhead costs and unfortunately our pricing wasn’t something we could change… until now! As production has gone up, our overhead has gone down and we’re now in a position to offer our products at a reduced price. As of February 4, 2019 Tall Grass Spirits will be available in 750ml bottles for $39.99 at Liquor Mart, the distillery (1680 Dublin Avenue), and of course at all of the wonderful markets we have the opportunity to attend on a regular basis. We hope this price reduction helps more of you enjoy what we love doing, and thank you all so much for getting us to this point. It’s your loyalty and love of our products that has allowed us to get to this point and we appreciate you all so much. We have big things planned this year and can’t wait to share even more exciting and good news with you! Stay tuned and happy drinking. Cheers! 2018 IS THE YEAR OF THE FARMER'S MARKET! We're hittin' the road this summer, spreading the word and selling as many Tall Grass craft spirits as we can at local farmers markets! So far we've had amazing success meeting new people and vendors and we can't wait for a full summer of fun. Ya we just said 'da bomb', but we said it for good reason! Our Tall Grass Rhumb and Tall Grass Oaked Grain Wheat Spirit have shipped and should be arriving in Manitoba Liquor Mart stores this week (yay!). Did you know that in Canada to be called rum a spirit has to be aged? it's true. Since we didn't have time to wait so our molasses spirit can't be called rum, so we're calling it Rhumb (sneaky right??). Anyway, this smooth, refreshing spirit will be perfect for your summer cocktail enjoyment. It's produced in Winnipeg, the heart of the prairies, but you'll swear that you're on a beach in Cuba. Try it with lots of ice and your fave cola, in a punch, or blend it up in a daiquiri. We promise you'll love it. Okay so the aging bit comes into play with this one as well. in Canada, whisky must be aged in oak barrels for three years. Ain't nobody got time for that so we sped up the process. We instead, aged this spirit with oak spirals that infuse it with flavour a lot quicker. Is it whisky? Nope. Is it delicious and something that we think all whisky fans will love? HECK YA! Try this baby on the rocks or in your favourite traditional whisky cocktail. It's going to flip your wig. (Note: we have plans to age both of these spirits and release a proper rum and whisky one day, so stay tuned!!). With May long weekend upon us make sure you're grabbing your Tall Grass spirits for the weekend. They'll make climbing into that freezing water to put the dock and water line in a lot easer (trust us!). Check the Manitoba Liquor Mart website daily to see what stores have our products in stock! It sometimes takes a while for them to order it so be patient, or just come buy direct from us at 1680 Dublin Ave! Tall Grass Dill Pickle Vodka Wins gold at the 'Great Manitoba Food Fight'! So ya, this happened and it was amazing. We want to thank everyone who has supported us to this point because this was a HUGE honour. There were some amazing products competing against us and there are no words to say how excited we are. So we'll just say thank you. To all of you who are buying this product (and there are a LOT of you) thank you for helping us keep the lights on. It's because of you that we're living our dream and for than we say THANK YOU! Tall Grass Dill Pickle Vodka is now available at the distillery! Calling all Caesar fans (heck calling all Canadians) our Tall Grass Dill Pickle Vodka is here! If you're a Caeser or Bloody Mary fan, trust us, you have to try this vodka. We start with our amazingly smooth Tall Grass Vodka (made from only the finest Manitoba grain) and infuse it with fresh dill, cucumber, peppercorns, and horseradish. The result is a distinctly Manitoban flavour that will blow you away. Not a Ceasar fan? Try this incredibly versatile product in a traditional martini, shaken with olives or lime, for a twist on the classic (plus you'll look incredibly dapper). Tall Grass Dill Pickle Vodka now available direct from the distillery at 3-1680 Dublin Avenue, and is expected to hit Manitoba Liquor Mart shelves mid next week. Stop by, taste our deliciously smooth Tall Grass spirit line, and say hello! Our tours are always free and we guarantee that you'll have great time! 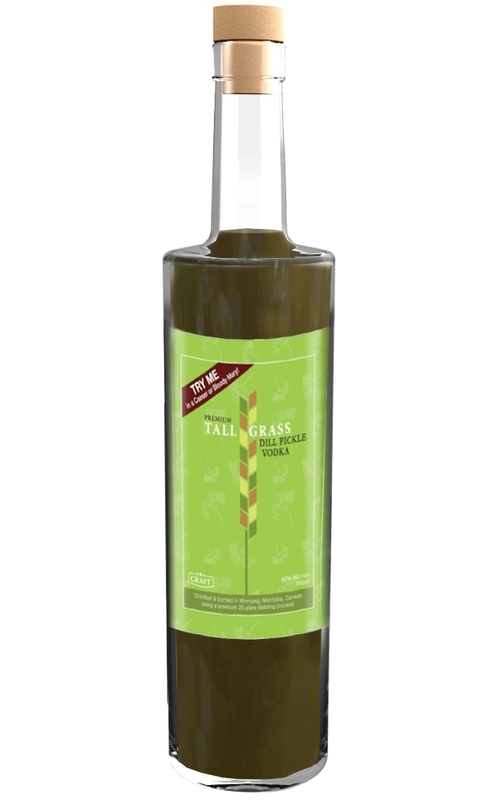 Introducing Tall Grass Espresso Vodka! The launch of our first flavoured vodka is really exciting for us. Not only is it the first of many delicious flavours (dill with peppercorns and garlic, orange, and lemon are coming up soon! ), but it represents the amazing things that can happen when local small businesses work together! Tall Grass Espresso Vodka is our premium craft vodka infused with De Luca’s premium espresso blend (pretty much the best coffee you’ve ever tasted), creating taste perfection! Tall Grass Vodka is a premium, handcrafted vodka, produced grain-to-bottle at our distillery, following a custom-engineered purification process using a 20 plate distilling column. Our vodka is produced using premium Manitoba wheat and rye, which is distilled from the entire mash (not just liquid), resulting in a very smooth, rich and delicious handcrafted spirit. There are so many amazing ways to enjoy this smooth, sugar free, espresso-y goodness. On the rocks, chilled neat, in a desert cocktail (you’ll be able to find some stellar recipes on our website soon), or as a substitute for coffee in an iced latte (Tall Grass Espresso Vodka + Ice + milk). Tall Grass Espresso Vodka is now available at Manitoba Liquor Mart stores (for a list of who’s carrying it click HERE), and direct from our distillery at 1680 Dublin Avenue. Please buy a bottle! Not only will stellar cocktails be in your future, but you’ll support two amazing small businesses (and earn tons of karma points). Join us for dinner in the distillery! Do you like premium spirits? Hand crafted cocktails? Fine dining? Good 'cuz we're hosting a pop-up dinner in the distillery and you're gonna love it! On Saturday, May 13 join us for an incredible evening of Tall Grass craft cocktails paired with creations from the incredibly talented Chef Rob Thomas. This one of a kind evening will begin with a tour of the distillery, welcome cocktails featuring Tall Grass Gin and Tall Grass Vodka (prepared by Bee's Knees Bar Services), and some yummy appetizers (Chef Rob is a genius!). Then join us at the dining table inside the distillery, for a gourmet three-course meal featuring Capital K's premium local spirits. Trust us, this is an evening you won't want to miss! NOTE: the dinner has extremely limited availability so don't wait to get your tickets (available here)! If you haven't heard the news our second product, Tall Grass Gin, is now available at the distillery and at Manitoba Liquor Mart stores! This product is truly a labour of love and we're so excited for you to try it. Even if you're not normally a "gin person" we know you'll be blown away (plus everyone should be a gin person, cuz gin is awesome!). "Tall Grass Gin is a refreshing experience, lending an aromatic nose with predominant citrus and floral notes. Handcrafted from the finest Manitoba grains and a proprietary blend of ten botanicals, Tall Grass Gin is made in small batches using a custom-engineered process and 20 plate distilling column. Tall Grass Gin drinks with a degree of softness, defying juniper heavy taste and expressing hints of coriander seed, rose hip, orange peel, cardamom, chamomile and lemon grass. Tall Grass Gin is perfect for sipping on the rocks or paired with soda. Made in Manitoba, this craft gin is distinctive, crisp, and one of a kind." To make it even easier for you to get your hands on it, this handy link will take you to list of stores currently stocking it in Manitoba! WEDNESDAY WAS A BAD DAY. Buy local and help it get better. So Wednesday was a bad day. As you may have heard, the Manitoba government decided to cancel a program that would have provided low interest loans to breweries and distilleries in Manitoba. These loans were announced in January 2016 as part of a program to help develop and stimulate the production of craft beer and spirits in the province. Opening a distillery was expensive. Hugely expensive. The low interest loan from the government was going to help us keep the lights on while we developed and marketed our product. It was going to be the cash that let us survive and say "Hey Manitoba! We're here, we're local, and we make the best darn vodka around!". Without those funds we have a much quieter voice and we need your help. We need you to help spread the word about Tall Grass Vodka, and Capital K Distillery. We need you to spend your money on locally brewed and distilled products because we need your support to survive. Craft products like Tall Grass Vodka are good for Manitoba. We purchase grain from local farmers, employ local people, stimulate the economy through sales, and make the best cocktails you've ever tasted. So please, help us. Buy Tall Grass Vodka and help us forget about the $250,000 loan that almost was. Help us keep the lights on and spread the word! Below is a copy of a press release that we sent to media outlets across Manitoba today. If you see us in the news please retweet, share, snail mail, or carrier pigeon the message to your friends. We'd really appreciate it. December 23, 2016 - Winnipeg, MB - Capital K Distillery, Winnipeg’s first and only producer of grain to bottle craft spirits, faces an uncertain future after Wednesday’s cancellation of the $5 million Supporting Manitoba Craft Brewing Strategy, an economic incentive loan program launched January 18 of this year. Expecting to receive $250,000 in low interest loans through the loan, the newly opened distillery hopes to instead draw holiday shoppers toward local craft purchases, in an effort to bolster sales and make up capital lost through the cancellation. The economic incentive loan was announced earlier this year by the previous NDP government, and was expected for implementation this past spring. The subsequent majority election of Manitoba’s Progressive Conservative government saw the Supporting Manitoba Craft Brewing Strategy put into review shortly following its creation, and Wednesday’s cancellation of the economic incentive loan has in turn devastated local craft brewers and distillers such as Capital K, who counted on it to get their business off the ground. Capital K Distillery is the first and only grain to bottle craft distillery in Manitoba, based in Winnipeg at 1680 Dublin Avenue and producing premium spirits. Founded in 2016, Capital K uses a 20-plate still to produce high quality grain-to-bottle spirits, which use all-natural ingredients sourced from Manitoba farms. Its first product, Tall Grass Vodka, launched in fall 2016 across Manitoba, with Tall Grass Gin and specialty vodkas expected for launch early 2017. A funny thing happened to us a couple months ago (and by funny we mean "eeek!"). A nice lawyer from Toronto called and told us that the name of our vodka was too close to the name of his clients vodka and we had to change it. We pouted for a bit and grumbled the way Manitobans do when people from Toronto tell us what to do, and then we started thinking up new names. And thus Tall Grass Vodka was born! We love the new name and think that represents the local pride that we feel so deeply. Our vodka is the result of hard working Manitoba farmers who tame the prairie and grow gorgeous wheat for us to transform. We're darn proud to be prairie people producing prairie, premium spirits. For now, the product with our old name and label (rhymes with "Brystal Wodka") is on the shelves at liquor mart, but it will soon be replaced with the new name and label. Regardless though it's delicious and you should go buy it.